Abstract : "Frieze is inviting entries for the Frieze Writer’s Prize 2010. 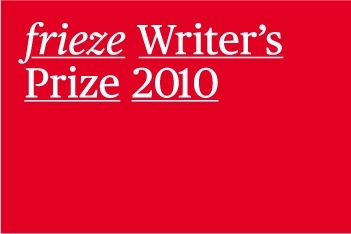 Frieze Writer’s Prize was established in 2006 and is presented annually. The aim of the prize is to promote and encourage new critics from across the world, and many of the previous winners and commended entrants, including Jessica Lott and Jeffrey Ryan, have gone on to contribute frequently to frieze magazine. Writers are invited to submit an unpublished 700-word review in English of a recent contemporary art exhibition. Applicants must be over 18-years old and must not have had more than three pieces of writing on art published in a newspaper or magazine. The closing date for entries is 25 June 2010 and the winner of the prize will be announced in September. The winner will be awarded £2,000 and commissioned to write a review for the October issue of frieze".